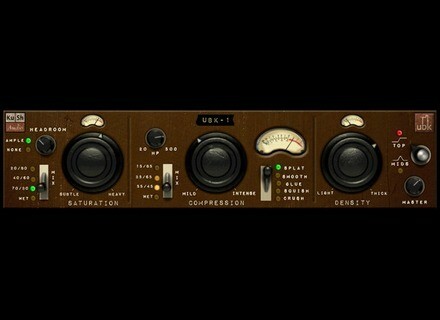 UBK-1, Other software dynamics processor from Kush Audio. The UBK-1 is a three-stage dynamics processor with simultaneous serial and parallel audio paths that offers control over a sound's shape, tone, and harmonic character. The processor has three engines - Saturation, Compression, and Density. Five compressor curves are provided, all based on the UBK FATSO hardware. A high pass (HP) sidechain filter allows for unorthodox shapes of compression. Two "Tele" style rockers control the wet/dry Mixes, and feature several preset positions as well as variable operation. A Headroom control simultaneously adjusts the intensity of all three engines. At the end of the chain, the Density engine adds an additional frequency-selective compressor/harmonic saturator, with a switch for targeting the mids or highs. The cumulative effect of these three engines is a thickness and musicality typically associated with expensive analog processing, Kush Audio says. To celebrate the release of these versions, Kush Audio will continue the special $149 selling price on the UBK-1 for the next 30 days. Mildon Studios Mildon Strummer 3 Mildon Studios has released Mildon Strummer 3, a VST acoustic guitar strummer for Windows. Sonokinetic Trailer Voice App Sonokinetic has announced the release of the iPhone version of the Trailer Voice App that was released for iPad a few weeks ago.